The undersigned, friends of Iraq from France, Belgium, the United Kingdom, Italy, Spain, Portugal, the United States of America, Egypt, Sweden and Iraq, organized in the International Anti-Occupation Network (IAON) and gathered in Le Feyt, France, from 25 to 27 August 2008, have adopted the following position and declaration reflecting our commitment to a true end to the occupation and to a lasting, sustainable peace in Iraq. The US occupation of Iraq is illegal and cannot be made legal. All that has derived from the occupation is illegal and illegitimate and cannot gain legitimacy. These facts are incontrovertible. What are their consequences? Peace, stability and democracy in Iraq are impossible under occupation. Foreign occupation is opposed by nature to the interests of the occupied people, as proven by the six million Iraqis displaced both inside and outside Iraq, the planned assassination of Iraqi academics and professionals and the destruction of their culture, and the more than one million killed. Propaganda in the West tries to make palatable the absurdity that the invader and destroyer of Iraq can play the role of Iraq’s protector. The convenient fear of a “security vacuum” — used to perpetuate the occupation — ignores the fact that the Iraqi army never capitulated and forms the backbone of the Iraqi armed resistance. That backbone is concerned only with defending the Iraqi people and Iraq’s sovereignty. Similarly, projections of civil war ignore the reality that the Iraqi population overwhelmingly, by number and by interest, rejects the occupation and will continue to do so. In Iraq, the Iraqi people resist the occupation by all means, in accordance with international law.1 Only the popular resistance can be recognized to express and defend the Iraqi people’s interests and will. 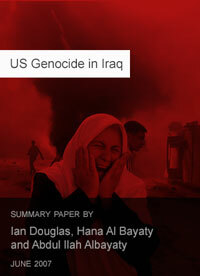 [pullquote align=”right”] Projections of civil war ignore the reality that the Iraqi population overwhelmingly, by number and by interest, rejects the occupation [/pullquote] Until now the United States is blind to this reality, hoping that a “diplomatic surge”, following the military surge of effective ethnic cleansing, will secure a government it imposes on Iraq. Regardless of who wins the upcoming US presidential election, the US can never achieve its imperial goals and the forces it imposes on Iraq are opposed to the interests of the Iraqi people. Some in the West continue to justify the negation of popular sovereignty under the rubric of the “war on terror”, criminalizing not only resistance2, but also humanitarian assistance to a besieged people. Under international law the Iraqi resistance constitutes a national liberation movement. Recognition of the Iraqi resistance is consequently a right, not an option.3 The international community has the right to withdraw recognition from the US-imposed government in Iraq and recognize the Iraqi resistance. It is evident that Iraq cannot recover lasting stability, unity and territorial integrity until its sovereignty is guaranteed. It is also evident that the US occupation cannot avoid accountability by trying to switch responsibility to Iraq’s neighbors. A pact of non-aggression, development and cooperation between a liberated Iraq and its immediate neighbors is the obvious means by which to achieve this stability.4 In its median geopolitical position, and given its natural resources, a liberated, peaceful and democratic Iraq is central to the welfare and development of its neighbors. All of Iraq’s neighbors should recognize that stability in Iraq serves their own interests and commit to not interfering in its internal affairs. If the international community and the United States are interested in peace, stability and democracy in Iraq they should accept that only the Iraqi resistance — armed, civil and political — can achieve these by securing the interests of the Iraqi people. The first demand of the Iraqi resistance is the unconditional withdrawal of all foreign forces illegally occupying Iraq — including private contractors — and disbanding all armed forces established by the occupation. [pullquote align=”left”] All of Iraq’s neighbors should recognize that stability in Iraq serves their own interests and commit to not interfering in its internal affairs [/pullquote] The Iraqi anti-occupation movement — in all its expressions — in defending the Iraqi people is the only force empowered to ensure democracy in Iraq. Across the spectrum of this movement it is agreed that upon US withdrawal a temporary administrative government would be charged with two tasks: preparing the ground for democratic elections and reconstituting the national army. Upon completion of these tasks the administrative government would disband, leaving decisions regarding reparations, development and reconstruction to a sovereign and freely elected Iraqi government in a state of all its citizens without religious, ethnic, confessional or gender discrimination. All laws, contracts, treaties and agreements signed under occupation are unequivocally null and void. According to international law and the will of the Iraqi people, total sovereignty of Iraqi oil and all natural, cultural and material resources rests in the hands of the Iraqi people, in all its generations, past, present and future. Across the spectrum of the Iraqi anti-occupation movement all agree that Iraq should sell its oil on the international market to all states not at war with Iraq, and in line with Iraq’s obligations as a member of OPEC. The 2003 US invasion was and remains illegal and the law of state responsibility demands that states refuse to recognize the consequences of illegal state acts.5 State responsibility also includes a duty to restore. Compensation should be paid by all state and non-state actors that profited from the destruction and plundering of Iraq. The Iraqi people are longing for long-term peace. On the basis of the 2005 Istanbul conclusions of the World Tribunal on Iraq6, and in recognition of the tremendous suffering of the aggressed Iraqi people, the signatories to this declaration endorse the abovementioned principles for peace, stability and democracy in Iraq. [pullquote align=”right”] The sovereignty of Iraq rests in the hands of its people in resistance [/pullquote] The sovereignty of Iraq rests in the hands of its people in resistance. Peace in Iraq is simple to attain: unconditional US withdrawal and recognition of the Iraqi resistance that by definition represents the will of the Iraqi people. We appeal to all peace loving people in the world to work to support the Iraqi people and its resistance. The future of peace, democracy and progress in Iraq, the region and the world depends on this. Mohamed Larbi Benotmane, law professor, Mohamed V University (Rabat). Saul Landau, scholar, author, commentator, and filmmaker on foreign and domestic policy issues, fellow of the Institute for Policy Studies – USA. Stéphane Lathion, swiss scholar (Fribourg University) – President of the GRIS (Research Group on Islam in Switzerland). The right to self-determination, national independence, territorial integrity, national unity, and sovereignty without external interference has been affirmed numerous times by a number of UN bodies, including the UN Security Council, UN General Assembly, UN Commission on Human Rights, the International Law Commission and the International Court of Justice. The principle of self-determination provides that where forcible action has been taken to suppress this right, force may be used in order to counter this and achieve self-determination.